Dear Leader. Damian Rogers. Coach House Press. Toronto, Ontario. 2015. 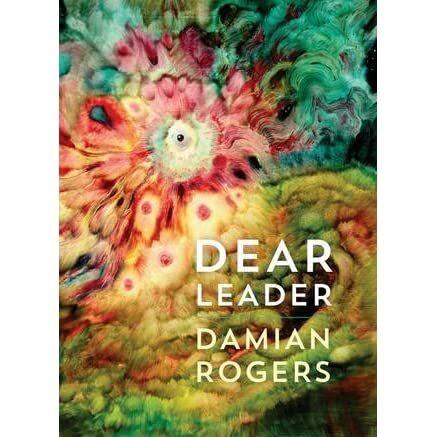 Today's book of poetry would by lying if we pretended to know exactly what Damian Rogers is going on about with every page in Dear Leader. But Dear Reader, what fine, fine music. Rogers can cook. Dear Leader is hot to the touch when you pick it up because it is so beautifully crammed with electric images and incandescent moments of truth that they rumble up on one another and create sparks, they make heat like an engine. Today's book of poetry has been down this road before, back on March 6, 2015, we looked at Damian's book Paper Radio. Today's book of poetry was a big, big fan of Paper Radio, everyone on our staff simply loved it -- so Dear Leader really doesn't come as a surprise but it certainly is grand, it certainly is welcome. List poems come and go but Rogers nailed Today's book of poetry to our seat when we read this beauty. Found delirious on the streets of Baltimore. Died days later. Shipwreck at the age of 40. Orphaned at 14, dead from tuberculosis at 25. Lost at 27 on a French hospital ship anchored in the Aegean Sea. Sister stabbed mother to death in a fit of anxiety. Drowned at the age of 30. Worked at the post office until death at 37. Died of fever in Greece on way to war. Went down sailing at age 29. Died of pneumonia while commanding a hospital in Boulogne. Stabbed to death in bar fight. Killed in action one week before war ended. Jumped off an ocean liner. Drowned swimming in Lake St. Clair in August. Sick with Grave's Disease for many years. Died of breast cancer. Swallowed by a sudden storm after seeing Doppelganger. Damian Rogers has a bit of the Midas touch because these poems are golden. Rogers is a poet you could easily follow into the dark reassured by her certain footsteps and that incandescent thing that she seems to know. Sun Ra. Damian Rogers dedicates a poem to Sun Ra in Dear Leader! I'm listening to him now as I type this, we all know that Sun Ra and his Arkestra will be blowing wild at the end of the world but only Rogers is singing about it. Whew. Our three poem limit here at Today's book of poetry is being bent today to allow for the following two poems to be seen together. You have to watch a baby close. I swallowed something hard and dark. It wasn't food. It moves around. The doctor wants to cut it out. I feel it now it's on my hip. It's very painful when it shifts. He ran my body through five tests. Then the doctor told me straight. I'll died if they don't cut it out. I'm telling you it has to go. on something quite this hard and dark. The only road is cut it out. In Dear Leader Baudelaire measures what counts and Yoko Ono may indeed by a witchy wonder. In Damian Rogers' world Mrs. Frank Lloyd Wright's coat can reign in reason. These poems move from the personal to the universal and back again in the blink of an eye, in the space between two lines. Today's book of poetry thinks that Dear Leader is full of kaleidoscope poems, multi-faceted and full of light. Dear Leader felt like a robust visit from a rock star poet pillager priestess. Damian Rogers drank everything in our office and then shot out the lights when she left! We should be so lucky. Today's book of poetry felt shaken and just the right amount of stirred. Originally from the Detroit area, Damian Rogers now lives in Toronto where she works as the poetry editor of both House of Anansi Press and The Walrus, and as the creative director of Poetry in Voice, a national recitation contest for Canadian high-school students. Her first book of poems, Paper Radio, was nominated for the Pat Lowther Memorial Award.